Lee B. has been a very long term loyal customer and supporter of ours , well before we were BM-Autohaus, back in the day he did all our glass work until an industrial accident took the use of his gear changing arm, so after this Lee had our successor do a “quick job” and the 2.7 m20 and manual to automatic conversion was done to his 1984 323i, he was mobile again, not very happy with this work performed, but mobile!! 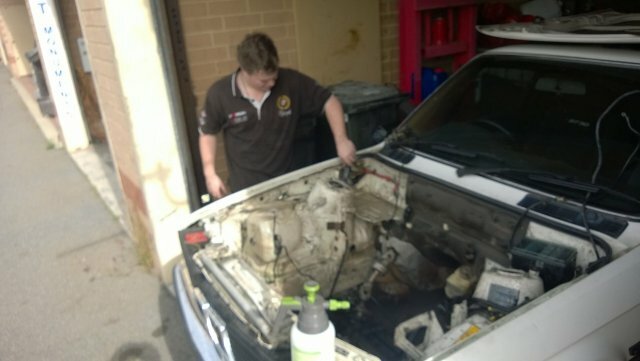 …on our return to business Lee seized an opportunity we gave him to take it back to manual and bring his long suffering gutless e30 back to the car he wanted YES! 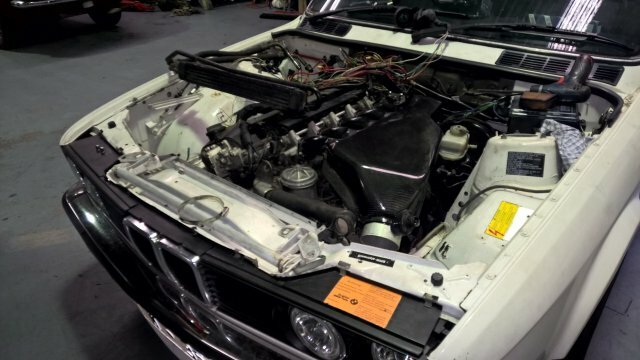 He bought the BMW S50 3.2 engine gearbox combination we removed from Andy’s compact, now it is going to power his fun for the next decade in a white chrome bumper e30 Coupe!!!! 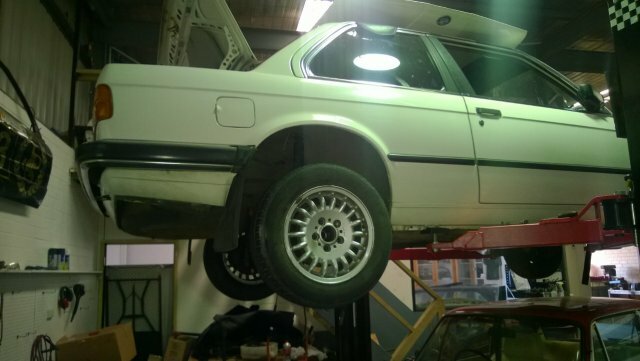 UPDATE 4/2014 – First up to ready the power plant for conversion, replace e36 oil sump and pump for e34m50 type, get e30 325 gearbox mountings, remove extractors as cylinder #6 will hit the firewall, gather complete e30 manual peddle box and clutch master/slave cylinders, gather all 5stud conversion bits and turn up a caster bush set to suit…….here we go! 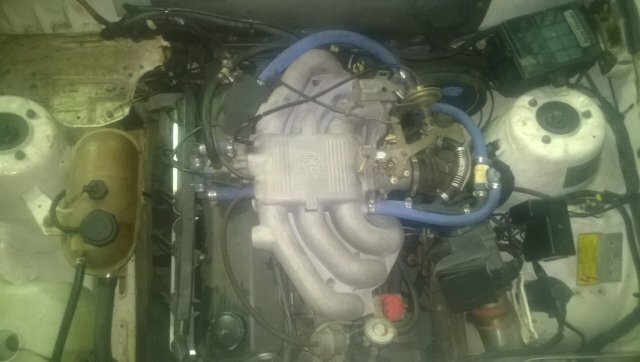 Update 6/2014 – This is the real beginning and bulk of the S50b32 conversion to this automatic m20 engine thingy with yuk exhaust! 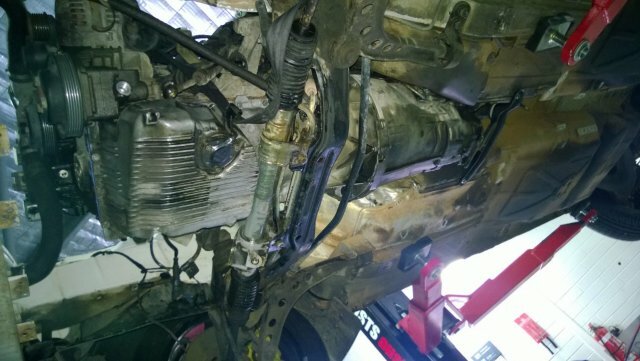 First up is removal of yuk m20 with garden like hoses and mess along with the auto box! 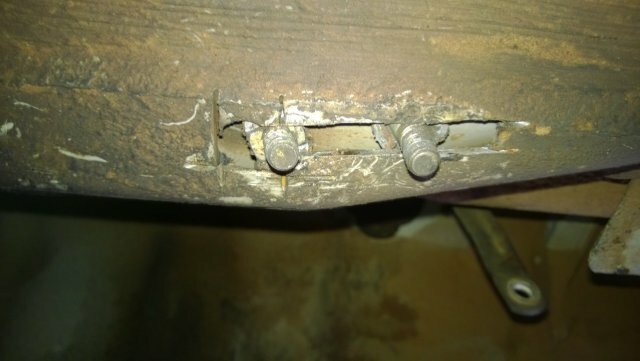 we have removed and done many conversions over the years…but never have we seen gearbox mount hacked into the floor and bolded up without support! 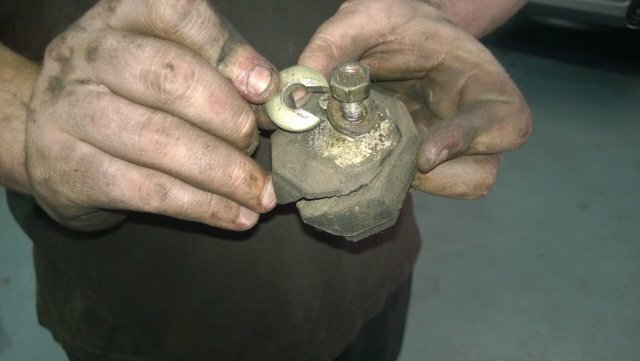 thank god this is not going back in!! 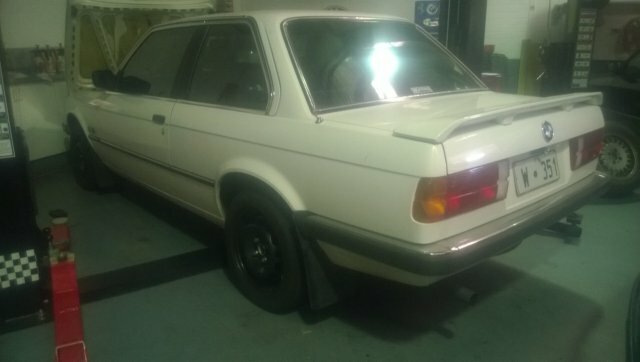 We are taking this car back to manual and repairing the floor for safety reasons, ok the butchered old crap is out and the s50b32 is in and on mounts! 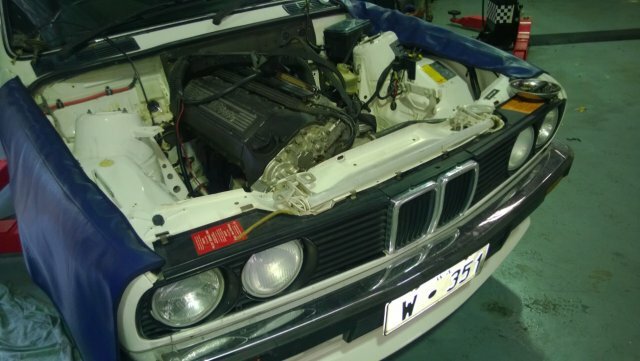 Update 7/2014- Now in and awaiting on e28 rubber engine mounts to arrive, will continue on with wiring , EWS-11 and fitting the Ecu’s into the e30, stripping the e36 loom apart to modify location of Ecu to under dash drivers side and fit into a e30 late plastic covering on the bulk head, will finish of what could be a messy loom to look factory! 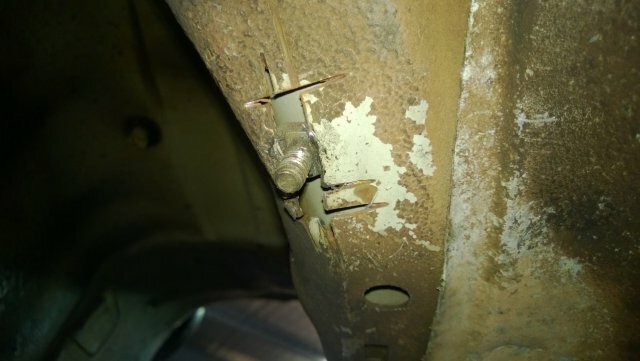 The BMW EWS anti-theft system is a lot of fun! 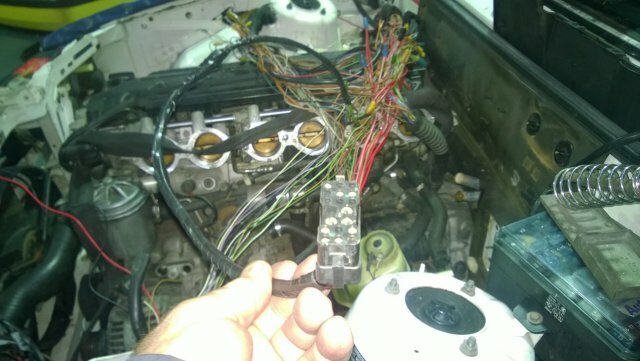 the wires from aerial ring around the key 2wire to interrupter bow and them 3wire connect to the EWS ECU and then the 16 wires joining and interrupting starter Engine ECU, etc. This is nearly finished ready to test but the car to Engine loom is finished! 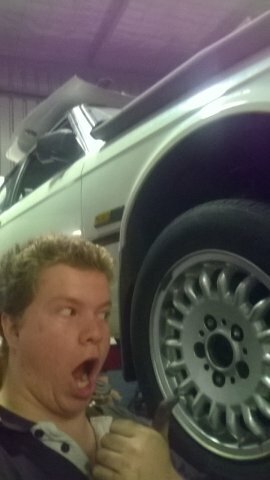 Update 9/2014- this month has been slow going on Lee’s s50 conversion, so onto the 5stud conversion with e36 “iS” wheels! 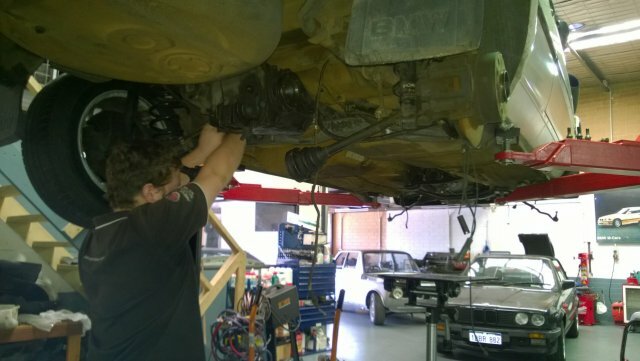 ..a funny thing, after looking a tailshafts to mod’ for this car ,Benny found that with using the 5speed box, a e36/7 (z3 2.8) tailshaft fits in perfect length, as does the gear select arms and short shift stick from the same car! 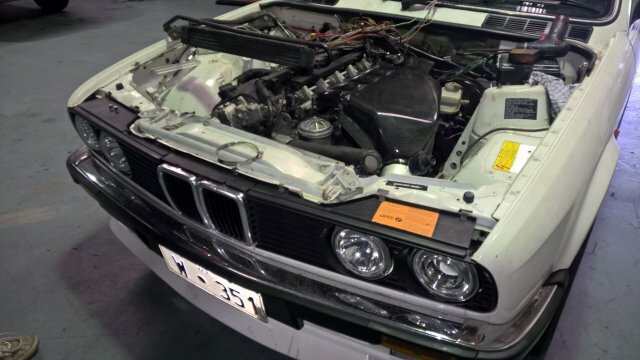 Update 3/2015 – After a long forced break on the 5so conversion waiting, the Extractors are now completed and Lee has gone ahead and bought a Carbon-fibre Airbox to suit s50 to e30! this is going to sound fantastic!!! 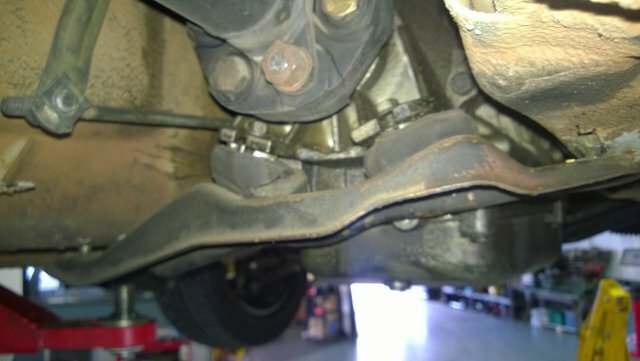 Update 5,6,7/2015- Clio brake booster fitted perfectly,wiring all sorted (3 wires came apart!) 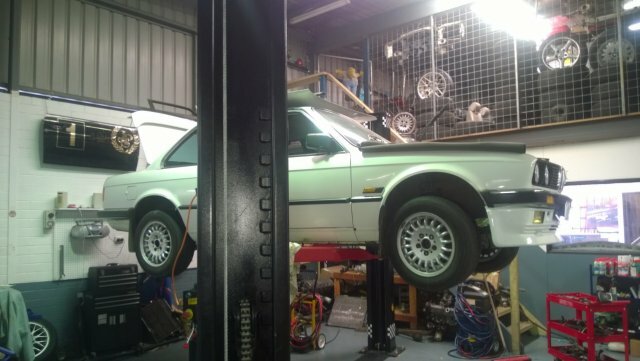 motor turns over through the EWS unit to starter, clean up of wiring to hide into factory e30 plastics and find/squeeze a air filter into place, not much to go now we are back on it!…..oil cooler , fabricate drift seats mountings to e30 rails……..Now it’s off to the Exhaust shop for the magic! 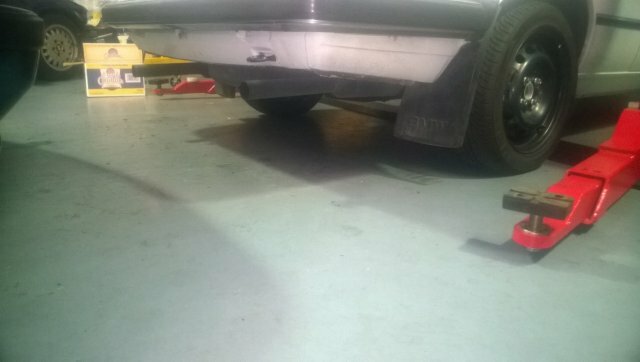 Update 2016 - On hold again ,waiting on the Engine Control Unit (ECU) in for repairs, we were going to get the EWS Deleted but found the switchable earth on the ECU …..had no earth!!! 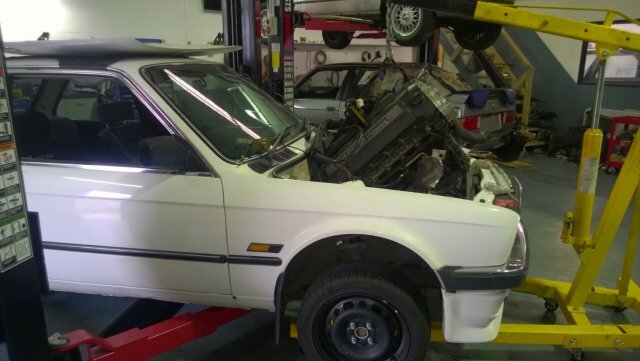 ….with the help of late …we had to go over everything only to find the original job we did wiring up to the e30 was spot on! 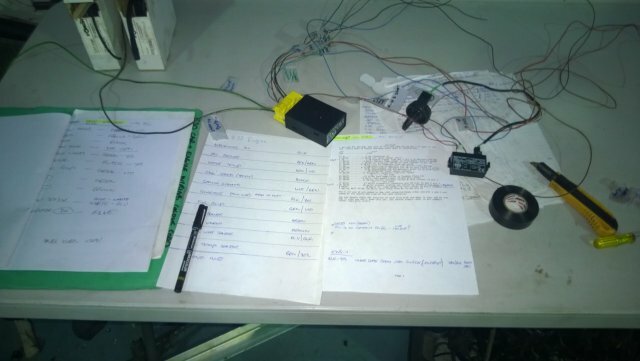 ….but in the meantime “The Help” wired up 12v power to this switchable earth ,through the ECU and fried the earth track on the printed circuit, so now we suspect more internal frying!!!! 6/2016 End of Job- On the upcoming Birth of his first child (Congratulations!! 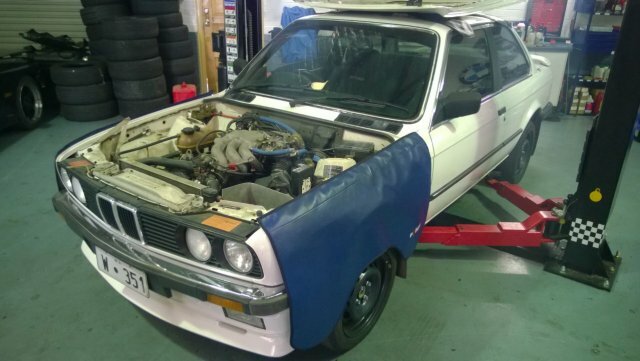 ), Lee is staying home to enjoy this, so having the spare time to go through the project to completion himself and a budget reduction ,has taken his beautiful E30S50 project home, Lee will use our Diagnostic equipment and anything else he needs in this time!….We are sad to see this go before it is completed and looked over, but respect the wishers of a long term friend to BM-Autohaus and us!